Department of Natural Resources and Environmental Management, University of Hawaii at Manoa, Honolulu, USA. Received September 16th, 2011; revised October 17th, 2011; accepted November 3rd, 2011. EPS is the most commonly used material to produce takeout food containers, a single use item that is quickly discarded. EPS alternative takeout food containers and their various product attributes in the urban center of Honolulu, Hawaii. of choice. 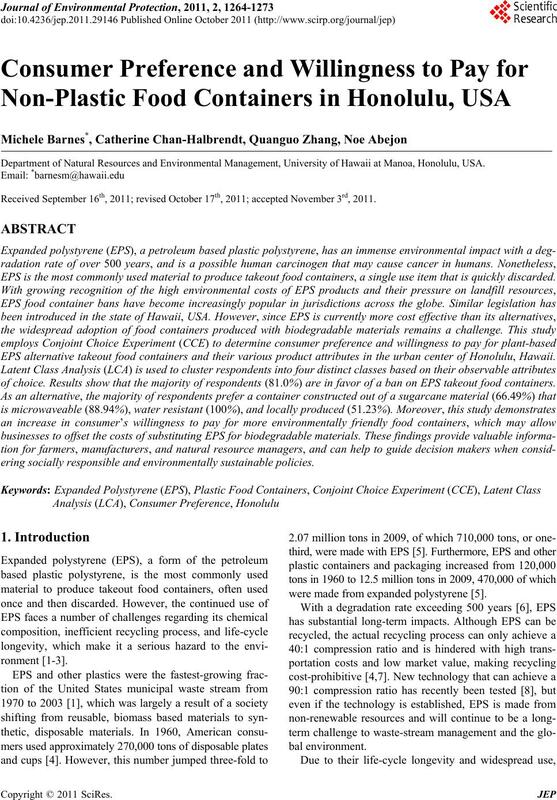 Results show that the majority of respondents (81.0%) are in favor of a ban on EPS takeout food containers. ering socially responsible and environmentally sustainable policies. were made from expanded polystyrene . marine debris by weight consists of plastics . zardous waste in the US . Taiwan, Japan, and the United Kingdom . consumers needed further examination . tainer industry and decision makers worldwide. in recent years for valuing non-market assets [22,25-28]. food container profiles for respondents to choose from. profile they most prefer from each task. dent to make tradeoffs between product attributes . based on the profiles chosen by the respondent . and their levels is shown in Table 1.
ware products, including takeout food containers [17,34]. ‘type of material’ attribute in the CCE. was either water resistant or not. duct was either locally produced or not. tion), this data was also collected from respondents. 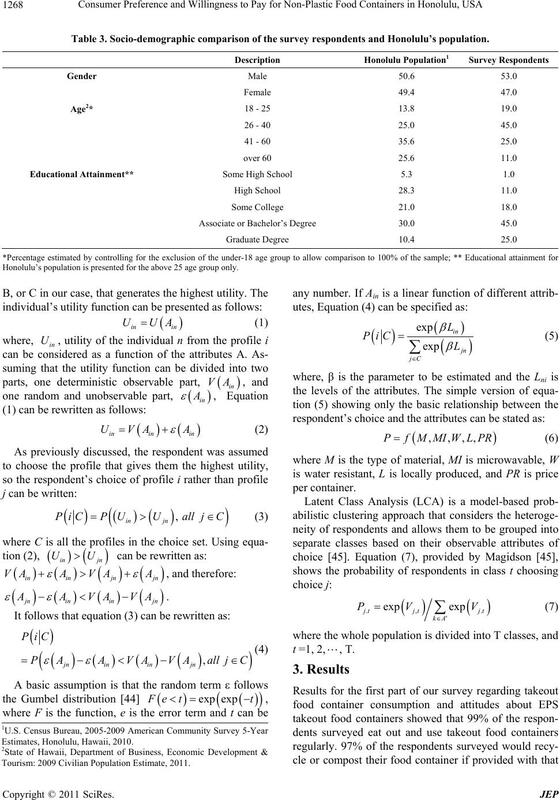 for respondents to evaluate and formulate decisions from. of all the attribute effects [27,40]. example of a task in a choice set is given in Table 2.
tral city center Waikiki at shopping centers and parks. Table 2. Example of a choice set. Orme’s  formula for sample size for CCE. familiar to the general public. Table 3. Socio-demographic comparison of the survey respondents and Honolulu’s population. Honolulu’s population is presented for the above 25 age group only. Tourism: 2009 Civilian Population Estimate, 2011.
containers in the city of Honolulu. model are shown in Table 4.
ers. A lower price was also significantly preferred. locally produced; and a negative preference toward price. this class significantly represented a younger age group. that they have a higher education level. function of takeout food containers. Table 4. Estimated parameters of the 4-class model. Note: *** significant at 0.01 level, ** significant at 0.05 level. resistant (28.13%) and price per container (28.09%). container (80.86%) as the most important attribute. container if provided with that option. being price competitive in this industry. additional $0.37 per container that is locally produced. Honolulu, with 81% of respondents in favor. current sentiment of local food and job security. where to increase consumer information and education. increasing rate of environmental degradation. Bulletin, Vol. 44, No. 9, 2002, pp. 842-852. Watse, Washington DC, 2010, p. 189.
sive,” Waste and Recycling News, Vol. 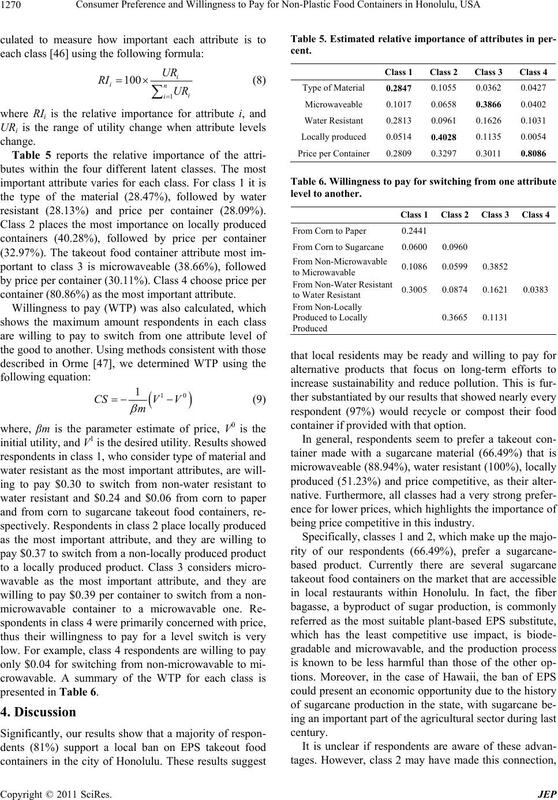 14, 2009, p. 26.
and Beyond,” Environmental Science & Technology, Vol. No. 7-8, 2004, pp. 790-794.
versity of Bridgeport Law Review, 2003, pp. 127-145. 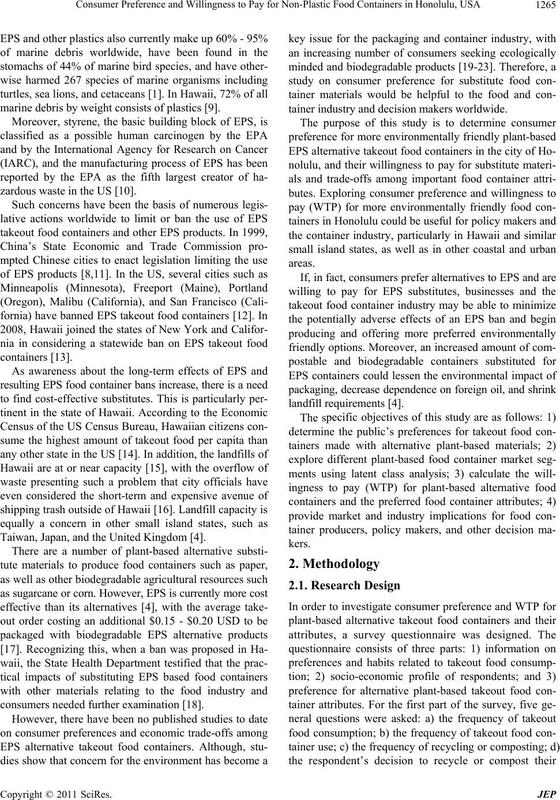 Packaged Food Business,” British Food Journal, Vol. 107, No. 10, 2005, pp. 760-780.
for Biodegradable Containers Than for Plastic Ones? cultural and Applied Economics, Vol. 42, No. 4, 2010, pp. tainable Development, Vol. 3, 2010, pp. 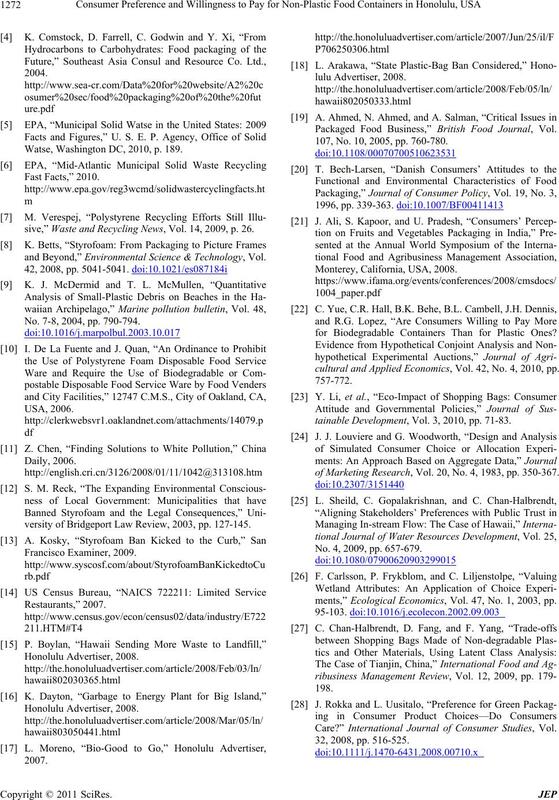 71-83.
of Marketing Research, Vol. 20, No. 4, 1983, pp. 350-367. No. 4, 2009, pp. 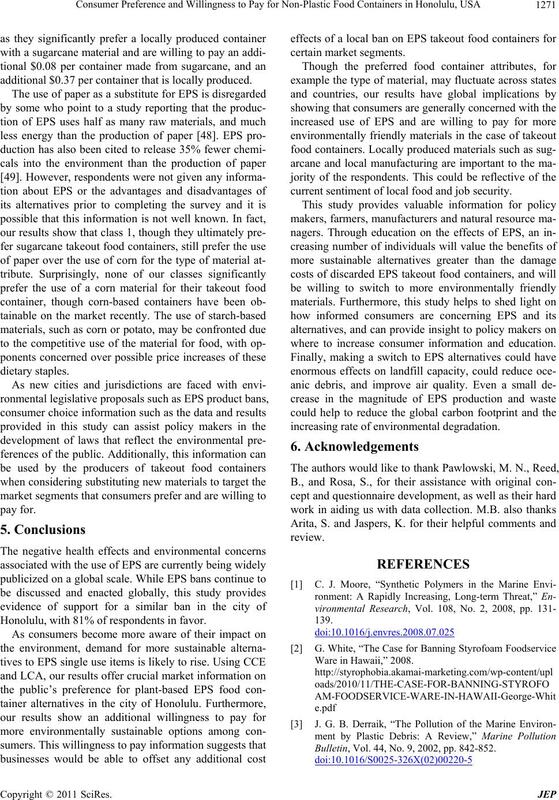 657-679.
ments,” Ecological Economics, Vol. 47, No. 1, 2003, pp. 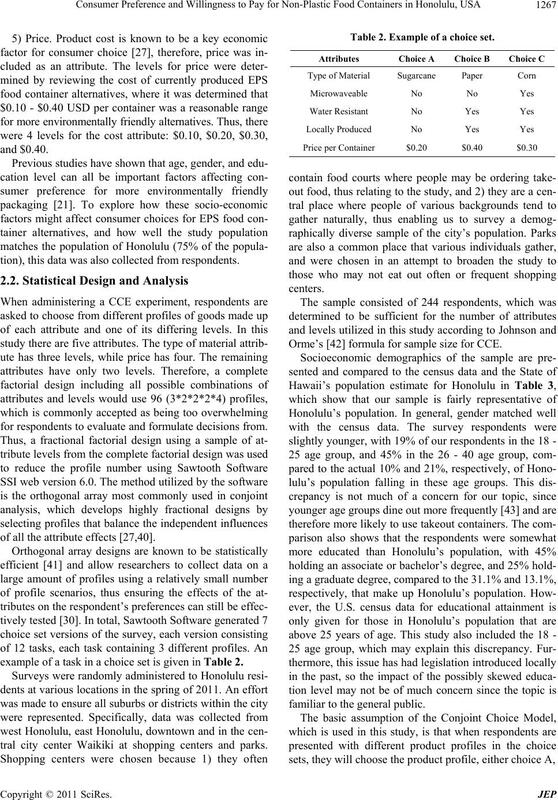 Care?” International Journal of Consumer Studies, Vol. ment Review, Vol. 10, 2007, pp. 117-140. 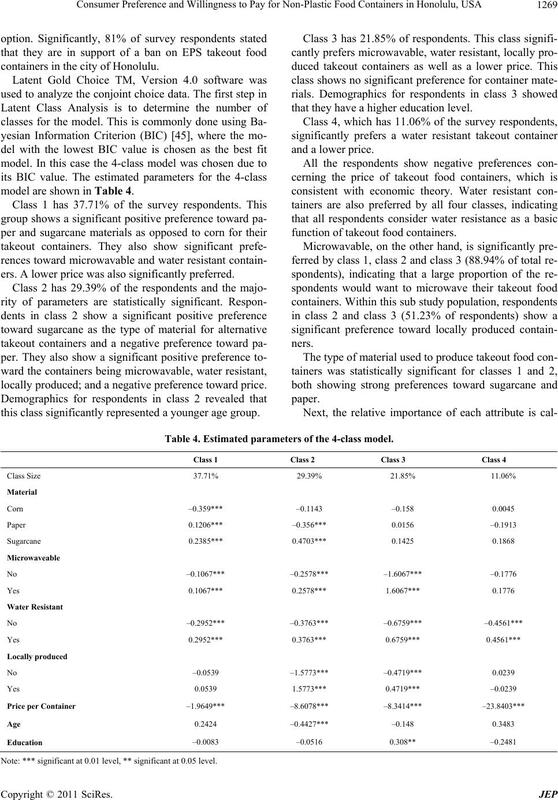 Latent Class Analysis,” Environmental Management, Vol. Oakland,” San Francisco Chronicle, 2006. Plastic: Dangerous or Not? “ 2006. 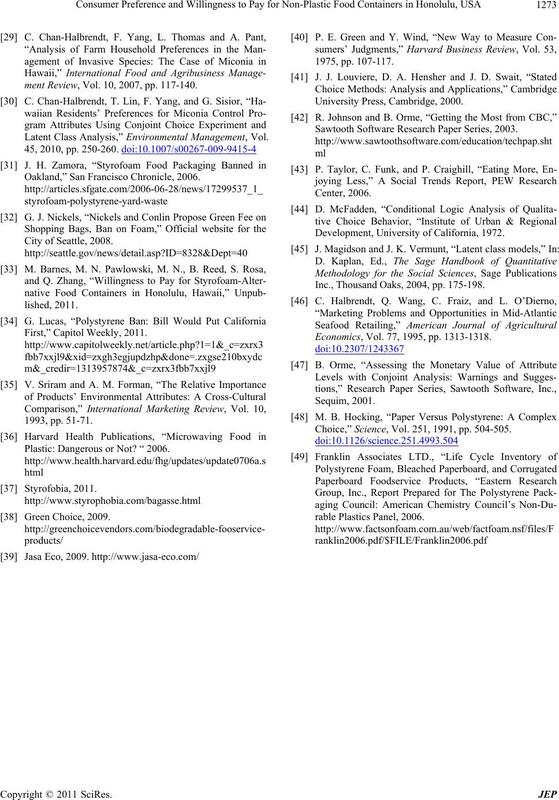 Sawtooth Software Research Paper Series, 2003. Development, University of California, 1972. Inc., Thousand Oaks, 2004, pp. 175-198. Economics, Vol. 77, 1995, pp. 1313-1318. 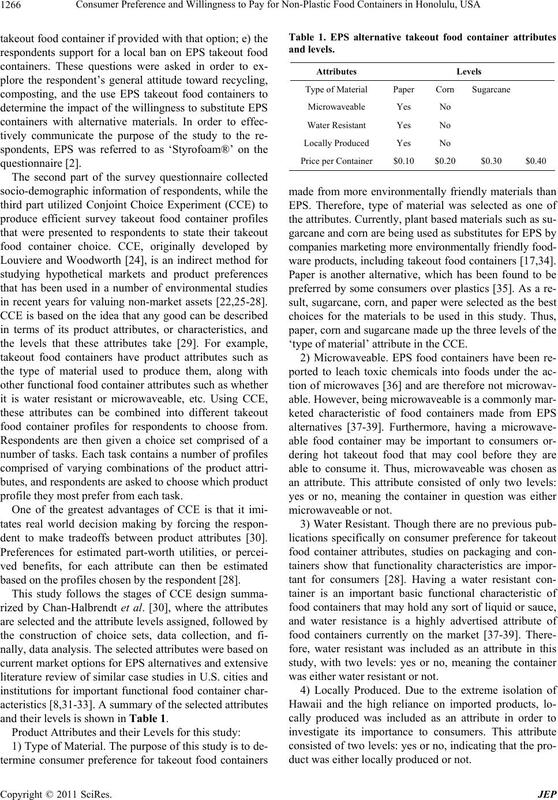 Choice,” Science, Vol. 251, 1991, pp. 504-505.